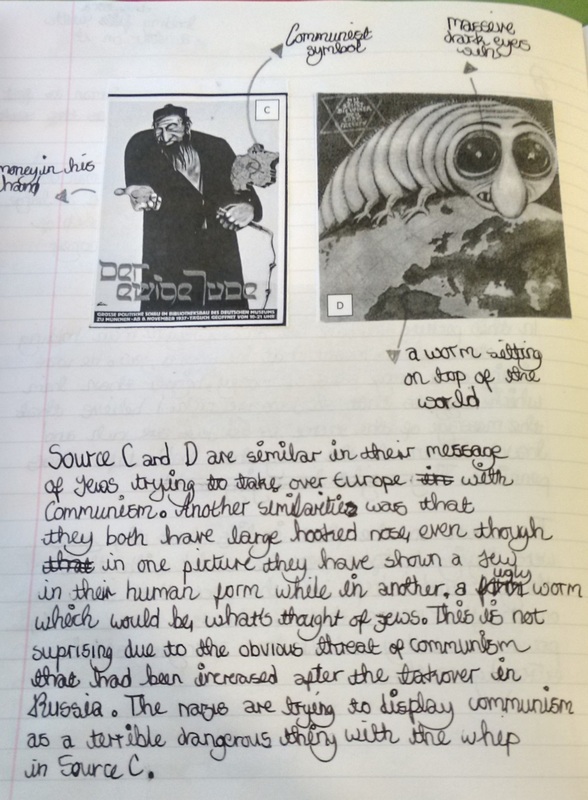 In this final post in our series on using sources in the classroom, Rich Kennett, Head of Humanities at Redland Green School, Bristol, writes on the topic of strong arming your students into using knowledge in their answers to source questions. At my current school the cohort is above national average attainment and many students are very able. 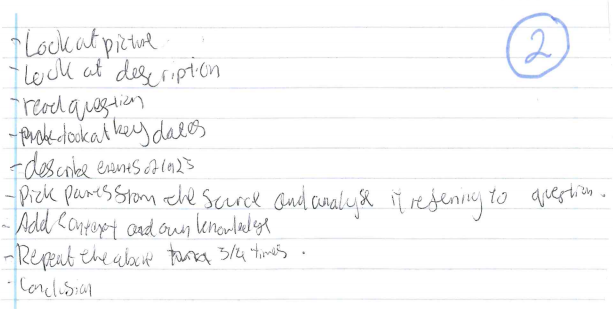 Two years ago, however, we noticed that, by and large, their answers to source questions weren’t great. 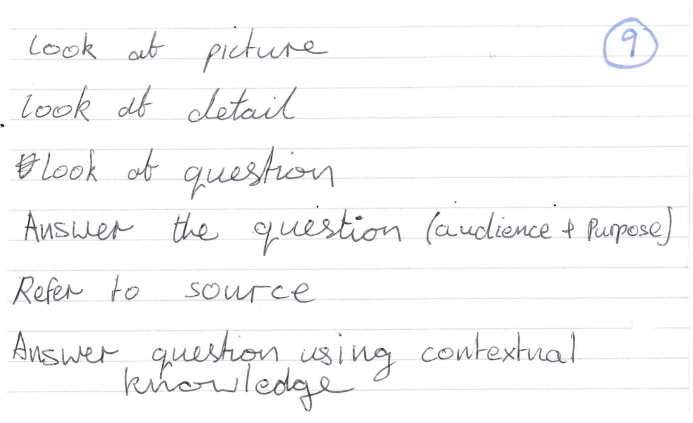 Students were good at picking out the details in a source but their answers were superficial and lacked any contextual knowledge. With the Clemenceau the Vampire source, for example, they would typically notice that the German woman has a shield, sword and helmet discarded by her side, details I had overlooked. They may have noticed the shield, sword and helmet but very few wrote about WHY or WHAT these elements might link to. This was the issue I set about tackling. 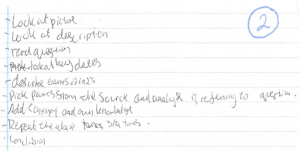 Now you’ll see that the students have all included knowledge in their list but it is so low down the list it’s almost an afterthought. 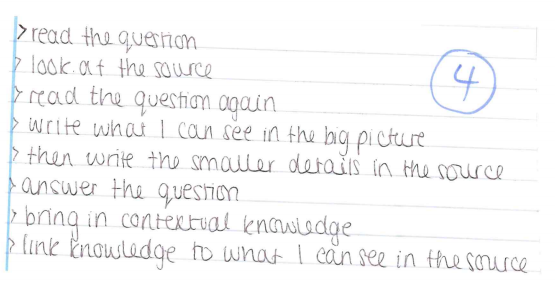 I needed to find a way to ensure students thought about contextual knowledge much nearer the top of their list. 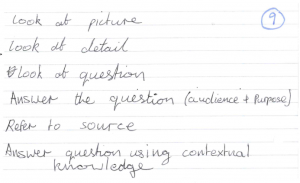 Certainly, examiners’ reports suggest this is what students need to do and I needed to find a way to help them to bring knowledge more prominently into their answers. 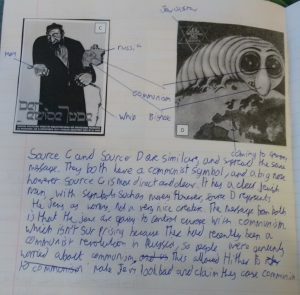 But getting them to use this simple phrase, students were able to make the link between the detail in the sources and their wider contextual knowledge. Let’s go back to Clemenceau. A typical answer from the students was “and in the bottom there is a sword, shield and helmet”. 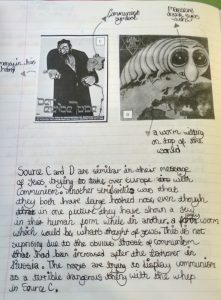 Now getting them to use these magic words, students have to link these details to some knowledge, for example, “and in the bottom there is a sword, shield and helmet. This is not surprising as Germany’s military was severely reduced in 1919”. 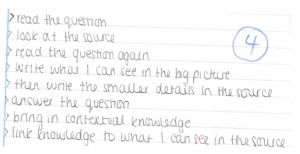 As simple as it sounds, these four words transformed my students’ answers. Now they link in knowledge and, as a result, have produced some cracking good history answers.